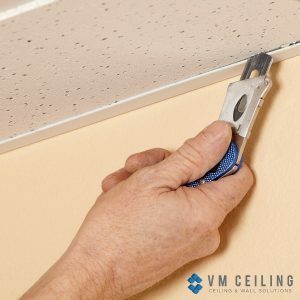 If you have stumbled upon this article, then you must be in the mood for some DIY False Ceiling Installation or just looking for some background knowledge before having the work done. If you want to save yourself from being cheated by false ceiling contractors, then you’ve come to the right place! Whether you are a professional or a newbie, it is important to layout the design on a graph paper. It not only helps in terms of measurement, but it also helps you keep track of the material used. You can bisect the room on the paper and plan everything for an easy installation process. Snap a chalk mark on the areas where you are going to nail. Remember to choose a height that clears the lowest ceiling obstruction. Use various types of angles such as an L angle, T angle for nailing. Nails may crack the wall plaster, thus it is important to give a slip in support so that it does not break the wall. When you drill an angle, you must slide in a fence staple especially where there are gaps. If there is a bow in the wall, you may need to cut the lower portion of the channel and later contour it. Even the pros use guide strings to measure the space between the nails. Strings help in positioning the screws while hanging them in the exact position. A string is wrapped around the screw and later securely clamped in the wall angels. 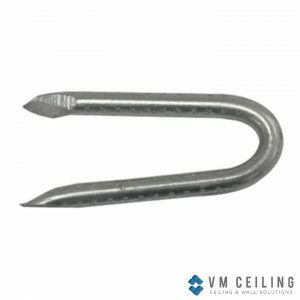 The false ceiling screws are different and they require special screwdrivers for clamping. Use a string to get the idea of the cross tee slots. The wall may not be straight, which is why you need the string to help you with the measurements. Once you have figured out the border row, cut your main tees and measure back from the cross-tee slots according to its size. Once the cross tees are hung and locked at the desired height, approx. at 12ft, it is time to lay the grid square. You need to check diagonal measurements. 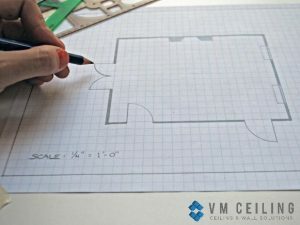 This step is probably the most tedious as it will show the overall design of your ceiling. If things are not set properly in the beginning, your false ceiling may go haywire. Additionally, you need to trim off the extra ceiling panel according to the measurement as well. Grid punch is a special tool that helps in making rivet holes in the panel. 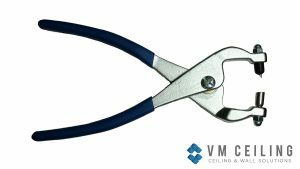 In order to ensure the cleanest cut, you must first cut the flange from both sides and then carry on cutting the stem. Cut the bordering panels with the knife to rest them in the track. Cut the panel following the scribe until hallway. Now finish cutting it using your finger as a depth gauge. Use gloves to prevent the oil to smudge the marks. Mark the holes on your drywall circle gauge. Make the cuts using a saw. 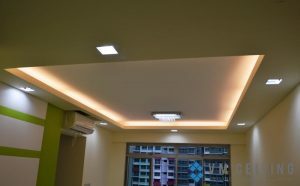 If you are new to false ceiling installation and want it to do by yourself, it is wise to watch and follow Youtube tutorials to understand the steps better. There are many tutorials available online, which will help you to install the ceiling panels all by yourself. However, if you prefer to do-it-yourself, start installing the false ceiling in smaller areas first, instead of diving head on to large spaces like living rooms and bedrooms. 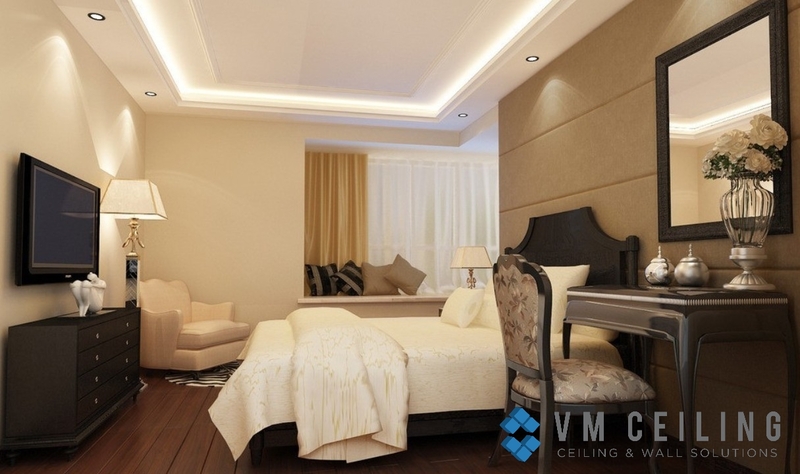 As such, you need to get the help of a trusted false ceiling contractor for bigger and more important areas. False ceiling construction is often risky and if done wrong, you might even harm yourself and the people around you. In order to avoid such cases in DIY projects, go for PVC false ceiling or gypsum boards that are easy to install. Most importantly, remember to have all the tools needed first before you start the project.